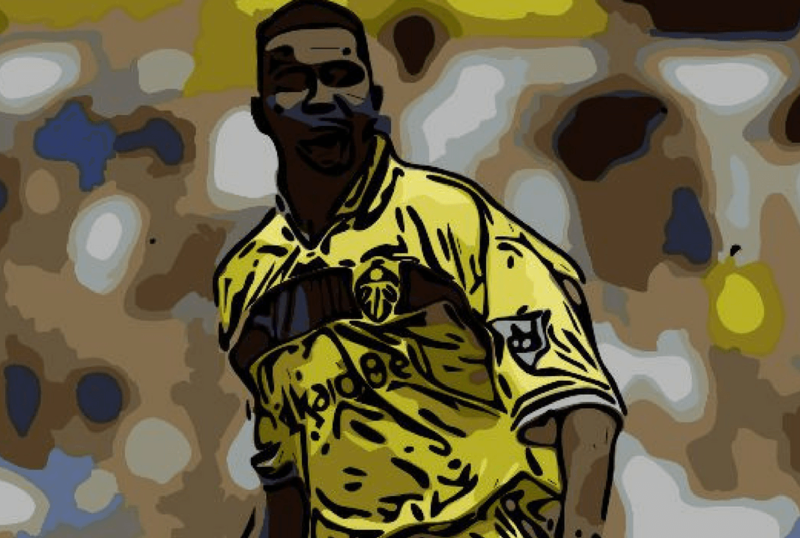 When you think of Leeds United in the 1990s and 2000s, you’ll probably recall the 1998/99 season where the club famously reached the Champions League, the club’s run to the semi-finals of Europe’s premier competition a year later, and the star players that appeared week in week out at Elland Road throughout those glory years. The likes of Mark Viduka, Harry Kewell, Rio Ferdinand and Jimmy Floyd Hasselbaink all plied their trade for the Yorkshire club around that time, all of them having high levels of success. None of those players, however, had as profound an impact on the club as South African central defender Lucas Radebe. ‘The Chief’ made over 200 appearances for Leeds, spent numerous years as club captain and even played in goal a couple of times. His efforts at the other end of the pitch, perhaps remarkably given the amount defenders now score, were less successful – Radebe never scored a league goal for the club, although he hit two in the 1998/99 UEFA Cup campaign. He became a cult hero at Elland Road, retiring in 2005 after 11 years at the club. Remarkably, Radebe only joined the club as part of a package to sign Mamelodi Sundowns striker Phil Masinga, the deal completed by Masinga’s FIFA agent Marcelo Houseman in the summer of 1994, Radebe moving from the club he had made his name in African football with, Kaiser Chiefs. Leeds finished in 5th place in the inaugural Premier League season the year before, and were desperate to add some more firepower to boost their chances of reaching the Champions League. Masinga, with a strike rate of nearly a goal a game for Sundowns, was the man they chose, signing for around £250,000. Radebe was included in the deal to keep Masinga happy. Radebe had already had quite a storied career, his spell at Kaiser Chiefs seeing him play goalkeeper and central midfield before settling in at central defence. Leeds fans got to see his goalkeeping credentials first hand during a classic at Old Trafford against Manchester United in the 1995/96 season, one of the South African’s most infamous moments coming in his second season for the club. Going into the match, then manager Howard Wilkinson decided to drop first choice ‘keeper John Lukic from the squad entirely, opting to go with Mark Beeney in goal and leave the bench without a substitute goalkeeper. When Beeney was sent off for handball outside the area, Radebe came off the bench and took over the gloves. He put in a highly respectable performance, only beaten when a Roy Keane deflected effort beat his outstretched right hand and nestled into the bottom left corner. United won the game 1-0, Sir Alex Ferguson’s post-match quotes lead to *that* Kevin Keegan interview. Despite his heroics, Radebe could not break into the team, making 13 league appearances total that season, and it took him until the following campaign to cement his place in the starting lineup. Masinga had left the club by then, with a record of five goals in 31 games, and so had Wilkinson, replaced by the recently sacked Arsenal manager George Graham. His appointment coincided with the appointment of chairman Peter Ridsdale and an increase in Leeds’s fortunes. The big money signings were starting to arrive, Hasselbaink and midfielder David Hopkin joining the club that summer for around £5 million total, and Leeds went on to finish 5th in the Premier League to qualify for the UEFA Cup. Graham left in 1998 to become manager of Tottenham Hotspur, Arsenal’s great rivals, but gave Radebe the club captaincy beforehand. Under Radebe’s leadership, Leeds continued their success, going one place better and finishing 4th in the 1998/99 season, before 3rd the following season finally meant qualification for the Champions League. Leeds progressed through both the first and the second group stages, finishing runners up to AC Milan and Real Madrid respectively. Probably their most remarkable result was a 4-1 triumph against Anderlecht, Radebe and record signing Rio Ferdinand blocking out the majority of the threat from a side that had won all of their last 20 home games. They went on to reach the semi finals, Radebe missing the 0-0 first leg draw with Valencia at Elland Road and the subsequent 3-0 defeat in the return leg that sent David O’Leary’s young side out of the competition. With Leeds’s success garnering plenty of worldwide attention, all eyes switched to Radebe that summer. He rejected Manchester United, AS Roma and AC Milan to stay at Elland Road in the summer of 2000, but just as soon as the South African looked on top of the football world, disaster struck. In March 2001, he went in for an aerial challenge with Sunderland defender Ross Marchant and fell awkwardly. Scans later showed he had torn his medial knee ligament against Sunderland, ruling him out of action for seven months. Then, in a reserve match against Sunderland during his comeback, he damaged ankle ligaments which set him back a further three months. It was a crushing blow to Radebe, who was still South Africa captain, having led the side into the 1998 FIFA World Cup and was expected to do the same for the 2002 edition. Radebe’s links with the national team went back to 1992, when he debuted, and he was a crucial part of the Bafana Bafana’s Africa Cup of Nations triumph in 1996. Despite his injuries, Radebe was determined to return in time to play in Japan and South Korea and although he did not make an appearance for Leeds in the season, his dream was realised that summer as he returned to the national fold. South Africa again failed to reach the knockout stages in 2002 but performed admirably, Radebe featuring in every game as captain. He even got on the scoresheet against Spain, his 53rd minute goal levelling the scores at 2-2 against Spain in their final group match before Real Madrid forward Raul added a third to win the game for La Roja. He retired from the national set up in 2003 – his last match fittingly against England – but not before a visit from South African president Nelson Mandela to Leeds in 2002. If one quote summed up Radebe’s influence and impact in not only Leeds, but across the world, this one is it. When Radebe eventually left Leeds in 2005, retiring from all football, he had racked up over 250 appearances for the club. His testimonial, held at Elland Road, brought in a crowd of 37,886 to watch his final competitive match in a Leeds shirt, and Radebe donated all proceedings to charity. He even had a beer named after him by a local Leeds brewery in 2008, titled ‘Radebeer’, and accompanied boxer Josh Warrington, born in Leeds, during his ringwalk for his 2013 fight against Lee Selby at Elland Road. Radebe was also the main reason behind the naming of the British band Kaiser Chiefs – the band from Leeds are named after his first professional club. Former Leeds manager Terry Venables called him “a champion, both as a sportsperson and a person”. Radebe typified the positive parts of Leeds’s success in the late 1990s to early 2000s which preceded their fall from grace in 2004, cementing his place in the club’s history books and ensuring that he goes down as a Leeds legend. He was one of the only players to stay at the club post-relegation, although he only made three appearances in what was his final season as a professional. The South African has openly stated in the past that he would manage Leeds if the opportunity came up – perhaps this chapter of the history books hasn’t been closed yet. Next articleHow NOT To ‘Do’ An Old Firm Derby!